Fashion is not something that just exists for runways or glossy magazines only. It can be dismissed as creative opulence when it really ought to be embraced as a nation’s art. Fashion represents ideas, intellect, and the soul of a people. Pakistan is a country full of talent, and that talent determinedly shines through in the face of all we struggle with. One of our best designers today is in the inimitable Deepak Perwani, an inspired genius. What makes him a national treasure is his loyalty and love for Pakistan, and the world witnessed it earlier this week. 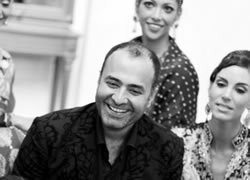 On the very important day of Eid-ul-Adha, Deepak Perwani teamed up with Pakistan’s Ambassador to the United States Husain Haqqani to hold a fashion show at the Ambassador’s Residence. Proceeds from the show going to the flood relief efforts. In this way, fashion was married to a humanitarian cause – helping the 20 million people affected by the worst natural disaster in our country’s history. It was worth a trip from New York to DC to witness this wonderful event. Fashion is about ideas. Showing the work of Deepak Perwani, a Hindu designer, encourages the idea of pluralism in our society, where people of all and any faiths may contribute in their own way. It shows how we live, what we accept and what the future can hold. We all hope for a peaceful and prosperous Pakistan, and with strong, civic-minded citizens, we can absolutely get there. It was a night of hope. Guests came to the ticketed event curious and intrigued, and they were not disappointed. 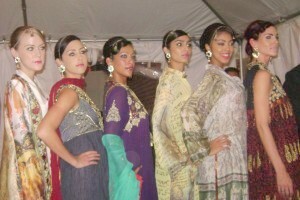 Deepak’s designs were simultaneously glamorous and elegant, and the noble cause they were to support had everyone aglow. The diversity of the guests and the fact that so many people were from Capitol Hill made us Pakistanis feel a sense of strong friendship and support from Washington, DC and the United States. Pakistan’s vibrant culture is unapologetically dynamic in the face of extremism. Our people are equally resilient and united against the militants, who only seek to ban the designs in favor of cloaks of misery. In the long run, they will lose, and they will do so because there are talents like the Ambassador, Deepak Perwani saab, and the millions of Pakistanis who work towards a peaceful, tolerant, and of course, colorful Pakistan. Sidra is a Pakistani-American currently studying in New York City. She has a love for fashion and film as her hobbies. This entry was posted in Blogs and tagged culture, Deepak Perwani, fashion, flood relief, husain haqqani, usa by Sidra Jafri. Bookmark the permalink.